The Fen Lake Ski Trail is located at the West Gate (km 0.0) of Algonquin Park. Much of this trail travels through the hardwood forest typical of Algonquin's west side. It offers four loops from 1 to 18 kilometres and offers both easy and more challenging sections. All trails are groomed and trackset. A shelter and toilets are located at the beginning of the trail and at Fen Lake. Walking, snowshoeing, skijoring, and pets (including dogs) are not permitted on groomed and trackset ski trails. Check the current ski trail conditions. The Fen Lake Ski Trail is located at the West Gate. The ski trail entrance is at the south side of the parking lot. 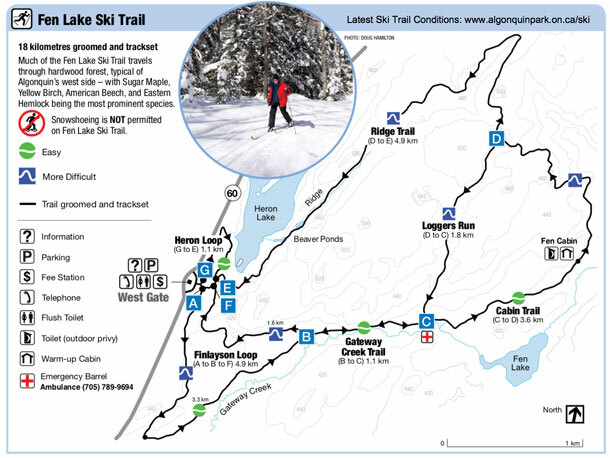 Click the image below to download the latest Fen Lake Ski Trail Map as a PDF easily opened with Adobe Acrobat or similar. Find out the latest Fen Lake Ski Trail conditions including grooming history, snow depth and more. Find providers of rental equipment in or close to Algonquin Park. A valid Park permit is required for trail use.